Get Your Bluebird Nesting Boxes Ready NOW! Bluebirds are Pairing Up and Choosing Nesting Sites, NOW! Most people don’t realize that our Eastern Bluebirds start choosing nesting sites now (end of February, beginning of March) — earlier than most other bird species. Although the actual egg laying and incubation cycle begins later in the spring, nest boxes should be up and ready!!! It’s beyond reassuring to see how Bluebirds have survived this especially harsh winter! 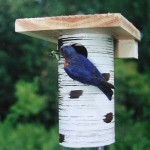 Want Bluebirds to Choose Your Nesting Box? If you’re one of the lucky, lucky folks who have Bluebirds grace their yard (we are truly envious! ), this is your friendly reminder that it’s time to be a good landlord. Position Bluebird nesting boxes in open areas at least a hundred yards apart. If placing new boxes, be sure they face the openness of a yard, meadow or field. Use Sparrow-resistant boxes. Keep treacherous non-native English House Sparrows from entering and taking over nest boxes!! A House Sparrow will kill the mother Bluebird when she absolutely refuses to abandon her eggs or nestlings, then immediately build its own nest on top of her warm body. Nests secure from these predators are critical to Bluebirds’ survival and nesting success. 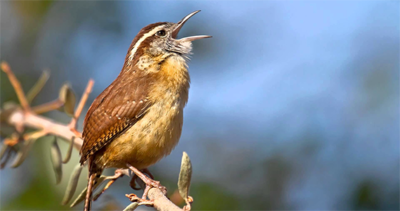 Please see our resource “House Sparrows: Deadly Foreign Invaders” for more. We recommend Slot Boxes or the Gilbertson Nest Box for this purpose. In winter, due to loss of natural feeding habitats, Bluebirds are adapting to new food sources. Although Bluebirds are not traditional wild bird seed eaters, reports are in that there’s a definite increase in their appearance at backyard feeders. Foods that nourish and are sought after by Bluebirds include: High protein wild bird foods, like: sunflower chips, peanut pieces, Bluebird suet nuggets and freeze-dried mealworms. In any season, a bird bath can also lure Bluebirds into your backyard. In winter, keep the water ice-free with a de-icer or heated bath. You’ll be rewarded! Check out a really inspiring photo from the Maryland Bluebird Society’s Facebook page. This could be YOU! While you’re there, show your support! Like them! Monitor Nesting Boxes on The Bluebird Trails! Even if you don’t have Bluebirds nesting in your backyard, Montgomery County Volunteer Bluebird Monitors are waiting to share and show off their Bluebird trails! Hike or take a stroll with them as they visit their nesting boxes. These are weekly opportunities that will continue from March until August. You can also help with Bluebird conservation, by joining the Maryland Bluebird Society. All membership dues and donations go directly to promote Bluebird Conservation… and it’s tax deductible. The Backyard Naturalist is a corporate sponsor and we can’t emphasize enough… Join!! If you’d like more info about the Bluebird Trails, go here to read or download a PDF with all the details and contact information. For more resources and to get involved in nationwide conservation, check out and join the North American Bluebird Society. Dr. Lawrence Zeleny founded this national group in 1978 to promote the preservation of Bluebirds, as the species was in serious decline. Since it’s beginning, (Right here in Montgomery County, Maryland! ), they have sought to educate, persuade, and enlighten the public in methods that we ALL can use to help bluebirds. Please support their ongoing research and education efforts with your membership.